This is one of my favorite places to purchase resources. Top quality and I have never been let down. Weekly, they offer a “Free Goods” email which contains a sampling of 6 free downloads. I look forward to getting this email, which twice a week, and includes a nice selection of free resources. Their collections include mock-ups, free fonts, logo and print templates, graphics, add-ons, icons, UI kits, and free stock photography. Not solely a free resource site, but well worth visiting and signing up for their newsletter. The resources here are well documented and reasonably priced. The newsletter is worth getting as well and typically some type of free resource is mixed in. Marked as exclusive free and premium resources, Deeezy offers some great free tools available for personal as well as commercial use. Much like Free Design Resources, Deeezy contains fonts, photos, textures, and mock-ups. Additionally, they have a free vector section. Another great resource site, but all Photoshop files. 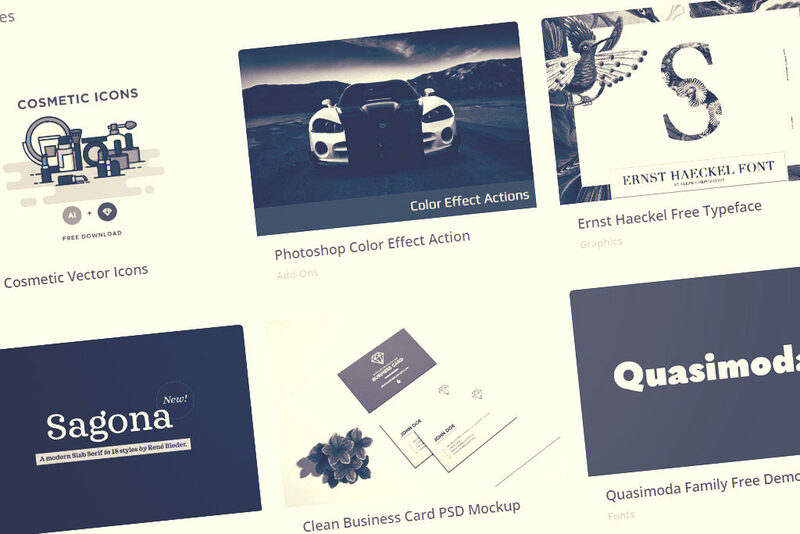 A good variety of mock-ups, templates, graphics, icons, and more. This site features some in-house work along with some featured freebies collected from around the web. Interesting mix of free resources, including some text and visual effects that aren’t always available at the other sites.